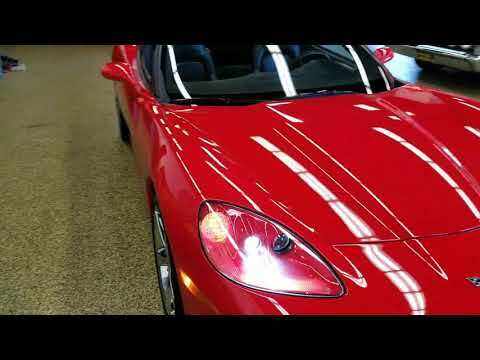 Look what just arrived, a low mile red Corvette! If you've been watching for a low mile well taken care of car here it is. It is a two owner car with a clear title and clean Carfax confirming it's never been in and accident and the miles are original. The paint is in nice shape and front nose cone is not all pitted from rocks and bugs like you see on many of these. The interior is in as close to new shape as a 7 year old car can be. The seats are not all worn out in the bolster area like you also see on so many of these. It is definitely a smoke free vehicle and free of any odors. Please take a little time to look over the pics from the bottom to the top and you'll see that this car is in very nice shape and shows it has been adult owned and driven. The 2nd owner just hasn't had the time to drive it and feels he should let it move on and not just sit in his garage. The front license plate bracket is included with the purchase but has never been installed on the vehicle. There is also a Corvette car cover and bag for it that will go to the new owner. The shade for the rear cargo area is also still installed on this car. No modifications have been made to this car such as exhaust or cold air intake. You can buy with confidence! Please feel free to call Jay, Jeff, or Landon if you have any questions on this vehicle or email "sales@uniquemankato.com" ALL OFFERS AND TRADES WILL BE CONSIDERED AND FINANCING IS AVAILABLE.